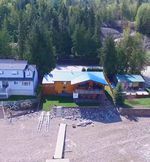 WATERFRONT on Shuswap Lake in exclusive Sorrento! Masterfully updated with every feature you could want this 4 Bedrm, 4 Bathrm year round home is just steps from the lake with your own beach, floating dock & boat buoys. 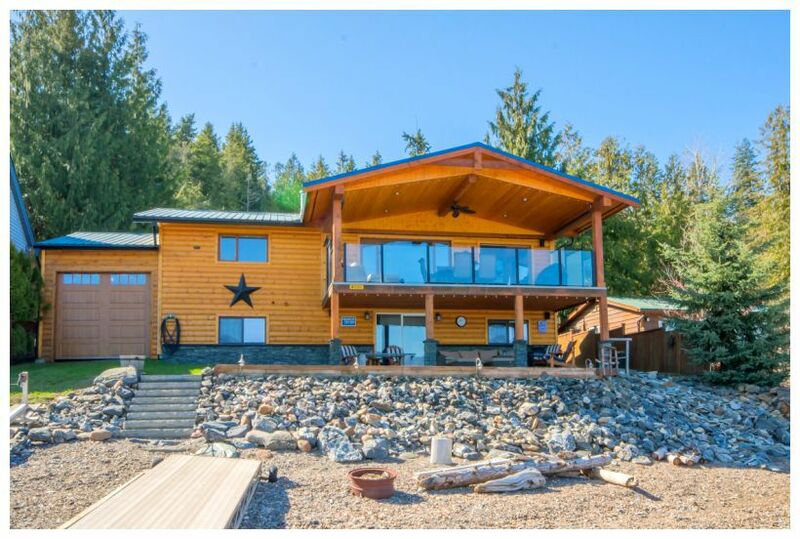 The property is located on a lakeshore road & spans both sides of the road with a fully usable 0.42 acres that includes your own 65 Ft of lakeshore. Included across the road is a 1 Bedrm guest cabin, detached double garage & plenty of RV parking. The home & property are meticulously maintained with an 'as-new' feeling. Included in the upgrades are metal roofing, cedar siding, landscaping, retaining walls & a modern interior with full A/C. You will love the island kitchen with granite counters & backsplashes over custom maple cabinets. SS appliances including a gourmet convection range. Living room & Dining room offer hardwood floors, wood ceilings & a custom wood feature wall with expanding views of the lake. Glass doors open onto the covered deck with open beam wood soffits, exterior fan, glass railings & duradeck. Below is a covered patio area that steps out onto your beach & dock. You'll love the lakeside boat house for storing your boat in the winter & keeping your lake toys in the summer. 2 Bedrms up/ 2 Bedrms Down; The Master Bedrm offers a 2 Pce, The main Bathrm has a huge European style walk-in glass/tile shower & the 3rd Bathrm up hosts the W/D too. The walk-out lower level has a huge games room area with bar & 2 fridges; includes a media family room, 4th Bathrm & 2 Bedrms. Appliances included and existing furnishing can be negotiated. Immediate possession is available! Items Not Included: Personal & Sentimental Items not included; Furniture not included but may be negotiable. Possession: Immediate possession is available!